The weather this winter has been far too prolonged in my view, and the disruptive effect it has had on a couple of our club meetings is even less desirable. The snow that fell in the afternoon of Wednesday 13th February, created many road incidents and major holdups in our local area; such that our demonstrator for that evening was grid-locked and had to cancel his appointment whilst en-route. A 15/20 minute journey normally for myself, took 105 minutes with several diversions. Fortunately, and not surprisingly, few members managed to get to the club that evening. At the Annual General Meeting held last month, we discussed – and themembers present supported – a number of changes. (A copy of the AGM minutes will be attached to this edition). I wish to highlight to you a few of the important ones. None of you will be surprised to hear that demonstrators’ costs are continuing to increase, especially travelling costs. To maintain a healthy financial balance, after lengthy discussion it was agreed to increase the annual subscription to £20 for the coming year. Hands On evenings will be £4 and £2 will be charged at Competition Evenings. All other charges remain the same. Saturday demonstrations – to avoid the period of winter weather it was decided that from next year, only two Saturday demonstrations will be booked – end of April and end of October – each in an effort to raiseattendances and hence lower their financial losses. A letter of thanks from the ‘School for Parents’ for our donation presented to them earlier this year is reproduced later in this issue. The School remains our nominated charity for a further year. We are only a few weeks away from holding our next competition – the David Francis Competition. So get your thinking caps on for producing your entry or entries. Pat and John Noakes, and I demonstrated at ‘Felley Priory’ on Sunday 7th April. The Priory is local to our club venue. We managed to raise over £180, on the day, for our nominated charity. Thanks to those of you who continue to donate turned pieces. May I remind you that annual subs are now due? As agreed some AGM’s ago those members who have not renewed membership by the end of May will be removed from our data base and will no longer receive correspondence. 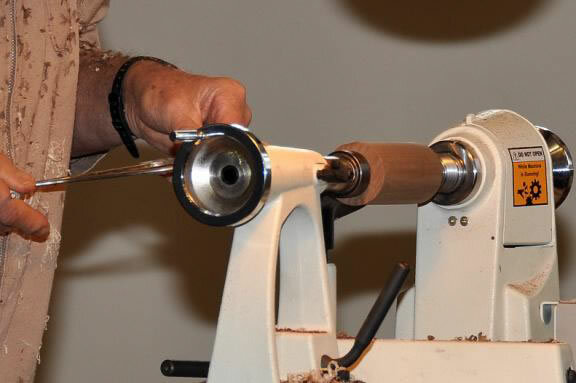 Remember – keep turning -always with safety in mind. Reminder – Hands On evenings on the 4th Wednesday of each month EXCEPT April, August, November and December. Paul Jones – is a first for our club. 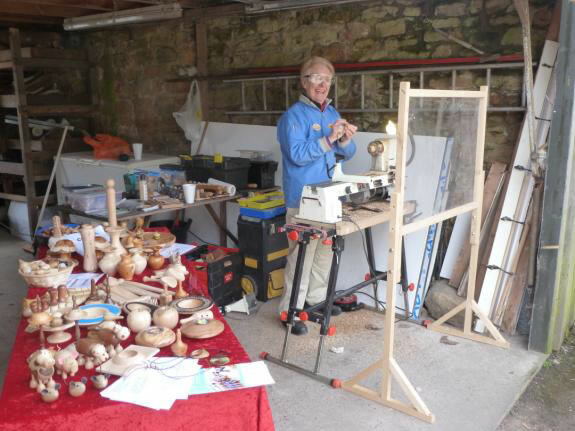 Paul is clearly a talented and artistic woodturner, having gained a bursary from the Worshipful Company of Turners a couple of years ago. Reminder – there is NO HANDS ON in APRIL due to a drama group holding a production in the Hall. Competition Evening – David Francis Competition – this is an OPEN competition to all except the trophy winner of 2012. If you have any items you wish to sell, consider bringing them along. A DVD screening will be held for the latter part of the evening. Hands On evening – details of what will be required in timber etc. will be sent via email closer to the event. Joey Richardson really needs no introduction. Joey is well known for her delicate pierced work and artistic flair for air brushing techniques and finishes. Hands On hosted by John Noakes, details nearer to the date. The evening, hosted by Trevor, was devoted to making spinning tops. The choice of design was decidedly open, but clearly the design that won the ‘time trials’ was those with lower centre of gravity. During the evening Pat made a number of her winning ‘Tippy Tops’. Vic brought along a number ‘garden twine’ holders, together with a number of blanks to be produced. During the evening several items were successfully produced to add to our charity cask. Ray Key – arrived bright and early to enliven us throughout the day with anecdotes and techniques from his annals of experience. He brought along his vacuum chuck to use, merely as a time saving tool, to eliminate the need to produce jam chucks, on the day. Ray explained that the ‘golden rule’ ratio of 1.618 : 1 appears in most of his work, even though he may not work from measurements. The ratio is always a natural balance to the eye, and can be demonstrated in many items that occur naturally in most living objects. 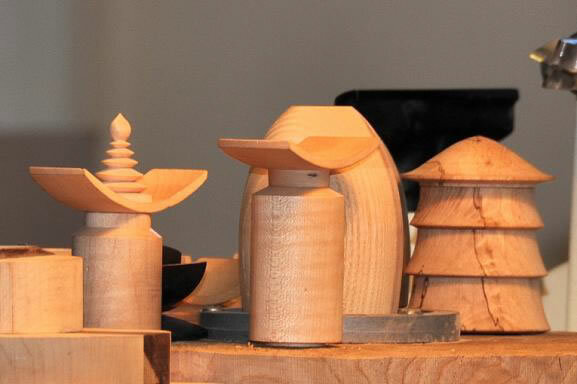 He discussed how his ‘oriental designs’ developed and proceeded to make one such piece. 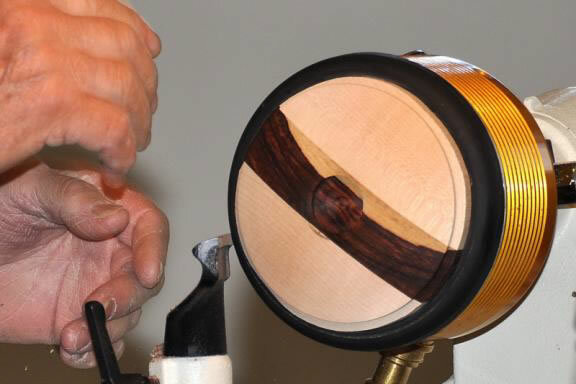 Ray then made a curved lid as part of the design from dark wood such as ebony or cocobolo. This is glued between two pieces of sycamore. 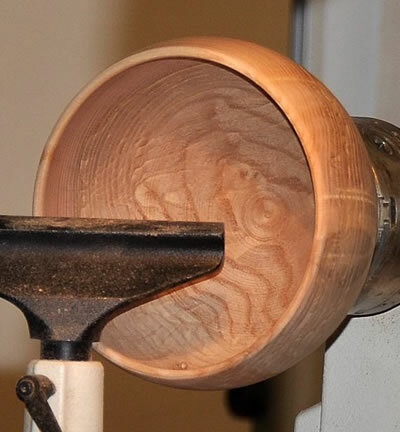 The body is shaped between centres – a spigot formed to hollow out in chuck. 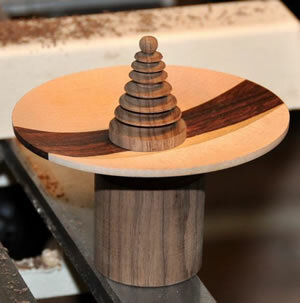 Finally the ‘fir shaped’ finial is turned. Ray went on to demonstrate and explain the better and most acceptable edges to place on larger platters. The second – shows detail correctly on the inside edge with the next one with more detail included. The next two designed rims are not aesthetically pleasing with the detail in the centre or outside edge. The final 3 designs show the two better designs for the inside edge. Throughout Ray again and again, cut these designs to demonstrate these aspects. 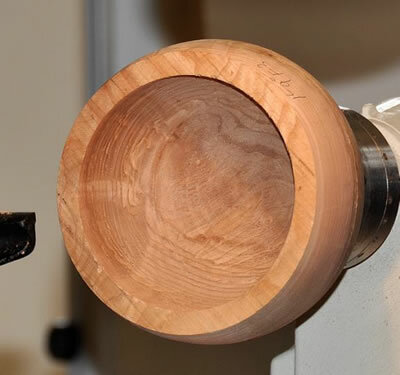 The bowl thickness getting thinner with each design being cut. Finally Ray produced a deep bowl in spalted ash. Rough shaped outside (mounted on screw chuck). Cut the base flat – glued sacrificial base – trued up glued base and cut spigot to size and fit spigot to chuck. 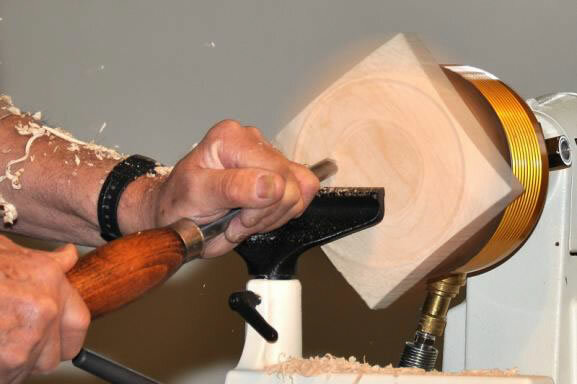 Part hollow out – refine and finish cut outside (often left handed cuts required). A thoroughly enjoyable day – full of anecdotal stories and advice throughout from a legend in the craft. Keep tools sharp and only use sharp tools and gouges. Sharp tools will cut cleaner and give a better finish to your work without the need to force the tool to cut. 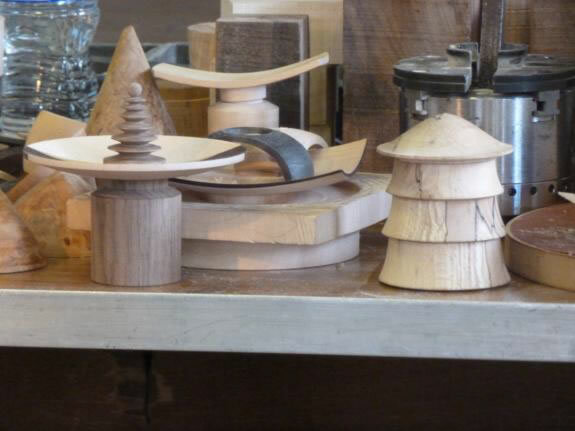 Band saw blades wander from the parallel, and circular saws overheat and scorch the wood when not sharp. The same applies when using abrasives – use a good quality, the benefit is worth it, (Gerry has a good selection). 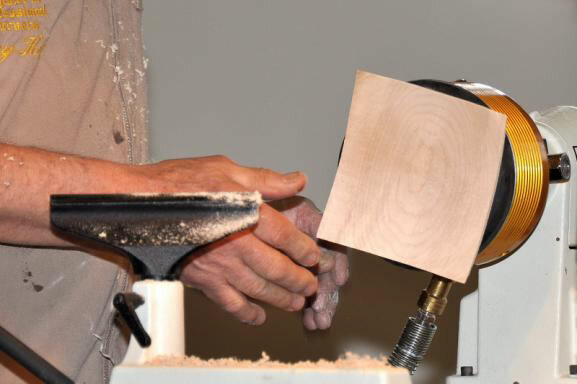 When using abrasives, commence with the most coarse grit for the type of timber being used. Do not substitute an abrasive for a poor quality tool finish. Always use clean abrasives, a worn abrasive must not be used as a substitute for a finer grade. Work through the grades, i.e. 120/180/240/360/400/600, etc. 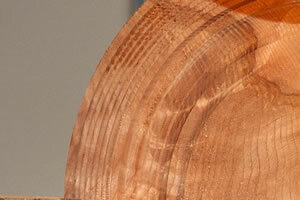 Skipping a grade is false economy and will often result in abrasion lines being left in the wood. 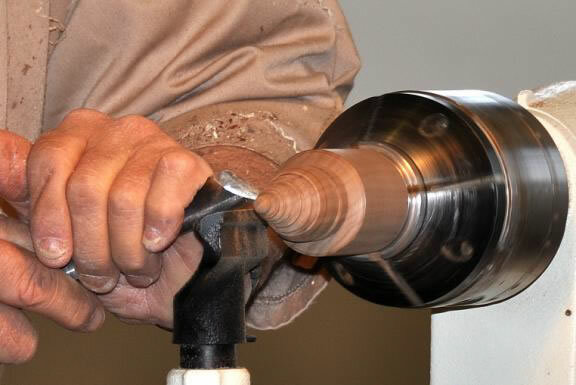 Apply the abrasive to the work at around 7 o’clock position looking toward the head stock when the work is spinning in the ‘normal’ forward state. If it is snatched, it will be away from your body. Keep the leading edge of the abrasive off the work – particularly relevant on natural edge work. Do not apply excessive pressure and always move the abrasive about the work piece to reduce friction. Think about it!! HOWEVER, please note that Axminster will only accept orders and payment from one person, who also has to accept delivery. 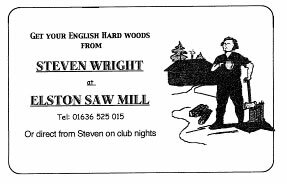 Our secretary, Trevor Lewis, has cautiously agreed to take on this demanding role and is willing to make and pay for your orders (members could get together with others to boost the order to over £100, if necessary), and to take delivery of goods as best he can. However, he will need to be paid promptly and reliably so he is not out of pocket when his VISA invoice is due! As mentioned in the last Turning Times, we have over the years recognised that certain items are far more popular as tombola prizes at our charity funding events. We therefore have put together a series of A4 project leaflets in a folder for the benefit of members, such as a design of:- mushrooms, animals (hippos, mice, owls, etc. ), cup & ball, ear-ring and ring stands, fruit, as so on…. These designs could be utilised at any of our ‘Hands On’ evenings, but also you as a member, could add or modify any of these and produce items for our Charity Table This folder will be made freely available at each of our meetings. Please note in the AGM minutes – this scheme is no longer operational. Please would you convey our thanks to the committee and all members of the Erewash Valley Woodturners Association for once again choosing School for Parents as your charity and please also let them know how much we appreciate their efforts of last year in raising £1,000, especially during such awful weather, which will no doubt have affected the turnout at those events that weren’t cancelled! We would be delighted to welcome more visitors from the committee to come and see what we do as I am aware that Pat and John enjoyed their time with us. If any members would like to pop down please let me know. Having attended the Ball you will be aware of our new video, with parents talking of their experiences. The link is here: http://www.youtube.com/watch?v=6aorp_2N_Ko&feature=youtu.be – please pass on to members to share. We need to raise £200,000 each year to ensure that children with motor disorders from across the east midlands get the early intervention support they need and that their parents are helped too, providing a much needed lifeline. Over the past few months we have children with a wide range of disorders including cerebral palsy, Rett syndrome, Engelmann disease, Hypotonia, West syndrome and Down’s syndrome, all needing the services we provide in order to help them be the best they can be. We have also begun speech sessions on Mondays for older children with Down’s syndrome – something they desperately need but do not receive elsewhere. Thank you for taking us on again, we are delighted that you want to continue to help. Your donations will most definitely have an impact on our service! As mentioned in the Chairman’s Comments we recently demonstrated at Felley Priory as a means of raising charity funds and increasing awareness of our club in the local area. We have been invited again to a one day function on 21st July to Felley Priory. Not yet finalised. We have however committed ourselves to a stand at Moorgreen Show, for the 2 day event on August Bank Holiday Sunday and Monday, this year, and also to the one day event at West Hallam Ploughing on September 18th. So please continue to make items for our charity support and consider attending our ‘Hands On’ evenings to help make more items for charity.